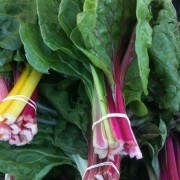 Chard is a tall leafy green vegetable native to the Mediterranean region. Like the beet, chard is a descendent of the sea beet. However, chard was selected over the years to concentrate its growth in its long succulent and colorful leaves, instead of its root like the beet. Because of this, many find chard and beet greens similar in flavor. Chard is found in farmers markets here in Hawaii sold in bunches – usually in the Rainbow or Swiss (multicolored red and yellow stems) and Green varieties. – Always wash and dry your chard. Lots of folks wash their chard like they wash spinach to get out tiny grit that make have lodged between the crinkles in the leaves. Rinse and soak, rinse, salad spinner or pat dry. – Baby chard (small leaves like baby spinach) is sometimes included in salad mixes, tender enough to eat raw. – Chop up chard and cook like you would kale, bok choy, watercress. Stir fry, sautee, steam, add to soups and sauces. Store chard unwashed in airtight plastic storage bag in the refrigerator for up to five days. To store longer, you can blanch the leaves and store in airtight containers or bags in the freezer for up to six months.